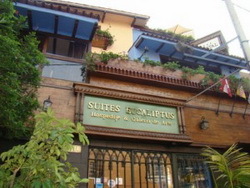 For 25 years we offer accommodation in a comfortable, cozy and ideal location within the city. We try where possible to make our guests feel at home and that our facilities have the best equipment and cleanliness. In and out of rooms you will find authentic art objects and antiques, a gallery of art. We have handicapped accessible rooms, spa suites for people who want to relax after a tiring journey, suites with balcony, terrace and flowers to enjoy the fresh air. All our single rooms are quite comfortable, equipped with cable TV, hot water 24 hours, safe and private phone. All our double rooms have cable TV, hot water, private phone and room service 24 hours. All our suites are quite spacious. have a jacuzzi, sauna, air conditioning, kitchenette, refrigerator besides all the basic amenities of the rest of our rooms. Our double rooms have cable TV, hot water, private telephone, air conditioning and safe. 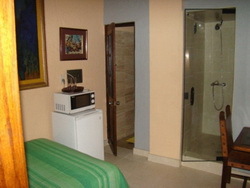 Our triple rooms have hot water, cable TV, private telephone, safe, etc.. They are quite spacious. We offer pickup service from the airport. We are 18 Km from Airport and 15 minutes from historic downtown Lima.